This Valentine’s Day, Harbour Grand Kowloon is filled with an ambience of love and romance in its restaurants and bars to offer guests an unforgettable celebration. 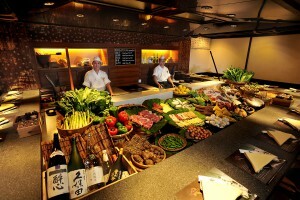 Embrace the romantic occasion with an array of delightful Japanese delicacies at Robatayaki. Guests may enjoy a special 9-course set menu including Assorted Sashimi, Tempura Scallop, Robatayaki of Dried Blowfish, King Prawn and Cod Fish and more. The set dinner is priced at HK$1,080 per person including a glass of plum wine and a red rose for ladies.